After a busy and stressful December last year, I vowed to never wait to until the last minute to finish my Christmas gift shopping again. I realized that by waiting until the last minute to shop for gifts, I had less time to come up with gift ideas, I had to fight the masses in traffic and store lines, and I spent way more than I should have. This year I am tackling my Christmas gift shopping early, and with a plan. The first thing I need is my shopping list and a budget. By preparing this simple list, you can keep your spending in check and be more realistic about how much you intend to spend this coming holiday season. I suggest compliling your list of everyone you will be buying Christmas gifts for. Next, write your maximum budgeted spending amount next to each individual on your list. 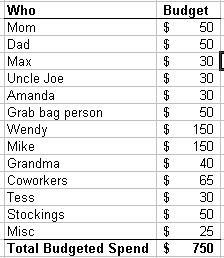 Finally, add the individual budgeted amounts together to get your total Christmas gift spending budget. Hopefully, the total budget amount is realistic for you. If not, go back and start adjusting the amounts you planned to spend for each person on your list. You are doing no one any good if you are spending more on Christmas gifts than you can really afford to spend. Who needs the added stress of a pile of credit card bills after the holiday season? This is one of the reasons why it is a good thing to plan your shopping ahead of time. Another good reason for planning is that you have more time to compare prices for gifts. I suggest searching for your specific gift ideas online. Find the lowest possible price you can for that particular item, then use that price as your price to beat. Let’s say your daughter wants a particular Hannah Montana Stereo… You search all over the internet and find a lowest price of $40; that $40 is now your price to beat. How do you do that? Start looking for coupons (either online coupons or print) that will bring that lowest price even lower. Two coupon websites that I highly recommend are retailmenot.com and couponcabin.com. These websites are no-nonsense sites that are relatively clutter-free and easy-to-use. It may also be a wise idea for you to look into rewards shopping networks (you may already be a member and not even know it!). For instance, Chase Bank has its Chase Rewards program which you can link to your Chase credit or debit card. When you shop using their directory of online retailers (and there are tons of big, well-known retailers listed), you receive Reward Points that you can use for future purchase discounts, or even trade-in for cash. Discover credit card has a similar, Shop Discover, online program. Many credit card companies have their own shopping rewards programs, just look into it for the cards you have. You may as well get something more out of the gift purchases you are going to make anyways. Also, don’t forget that shopping online is going to save you gas money and time! So, with some planning and budgeting, I plan to enjoy my Christmas season this year, not spend it rushing around trying to purchase Christmas gifts at the last minute. I challenge you to do the same! My guess is we’ll all be in better holiday spirits if we do. Where to Find The Best Fireworks Display in DuPage? © 2019 DuPageBlog.com. All rights reserved.